Do you want to spruce up your house when you’re on a budget? Or maybe you just want the place to look a little different than what you’re used to but don’t want to spend a lot of money on redecorations? Don’t worry, because all those discarded, broken items you’re thinking of throwing away right now – you can use those to change the look of your house. Instead of throwing away used up household items, you can reuse them to add a personal touch to your house. You can save up a lot of money on decorations and recycle trash in this own way. Turn old vodka bottles into fancy lamps. 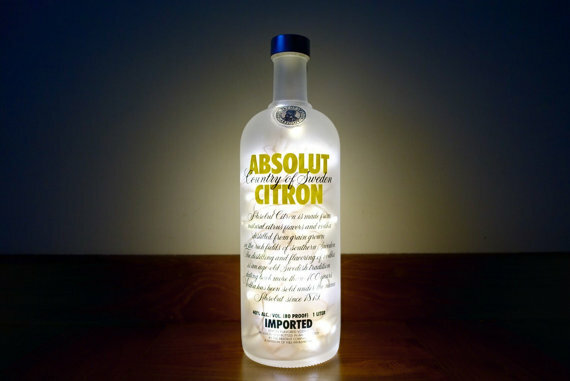 We all have a lot of glass bottles to throw away but instead of doing that, save the ones that look nice and repurpose them into fancy lamps. Buy some fairy lights and insert them into the bottle, plug it in and turn it on for some nice, atmospheric lighting in your living room. Use your broken entertainment center as a bookshelf. Entertainment centers usually come with a lot of different compartments. Once one of the main areas like the TV holder is broken, it’s pretty much useless, right? We don’t think so. Take a hammer to it and break down a few of the compartments, paint it anew and use it as a shelf to keep all those books you never found a proper place for in the house. Make colorful candles from wax crayons and old glass jars. This is doubly useful as you can repurpose not one, but two discarded household items. Just melt the wax crayons and pour them into an old glass jar with a broken lid till it’s full. However, remember that the wax used in crayons is not created to be lit so only burn the candles in emergencies. Otherwise, it can just be something to make your home look pretty and colorful. Transform an old suitcase into a bed for your pets. If a suitcase is broken or just old enough to not be usable anymore, separate the two halves and use the deeper half as the hollow space to put a soft blanket in. That will works as a mattress for your pet. Make sure to attach the fixture in so it doesn’t go out of order as soon as your pet gets playful. Use lots of colors to make it look good, it will add to your house’s charm and make a comfortable place for your pet to sleep in. Turn a broken table into several book racks. A table has several slats of wood and you can take it apart to use the slats separately to re-purpose them into book racks. You can paint them to match the rest of the room and nail them to a blank wall. It’ll make for a nice change in the look and add more space to keep your books where you can find them easily.